One of the first items we purchased for Corbin and Lynley before they were born were crib mattress pads to make those kind of hard, plastic lined mattresses more comfortable. We didn’t want to spend a fortune on luxurious crib mattresses for babies who would likely sleep on just about anything, but it was important to us to find quality, inexpensive products. 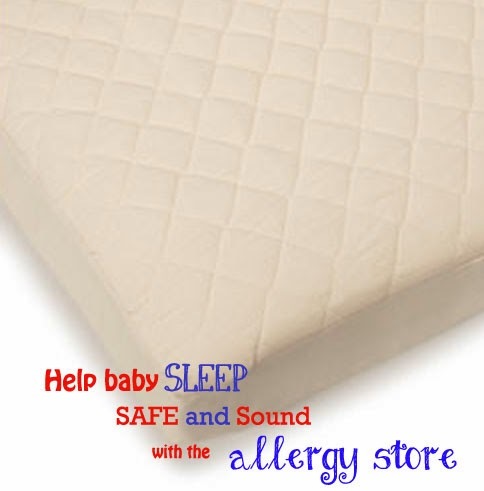 I wish that we would have known about the Allergy Store‘s line of crib pads and mattress protectors. Not only are they super soft, but they have the added benefit of being all-natural and chemical-free for allergy control. Derrick suffers from a long list of allergies, and the longer I have lived in Central Texas, I have discovered so many that I have never been affected by. So with genetics, and adding a big, chocolate lab to the mix, Corbin and Lynley are sure to develop allergies at some point. We could all benefit from at-home allergy management with products from the Allergy Store. Since 1989 The Allergy Store, family owned and operated, has been helping customers across the U.S. and around the world find non-drug solutions to their problems with allergies and asthma. The owners know first hand what it is like to live with allergies every day and what it takes to make it better. Many, satisfied customers agree that the Allergy Store carries the best and most effective allergy and asthma control products available out there. When shopping for our crib pads, we originally just bought whatever was on the rack at the baby store in town. I quickly found out, the waterproof ones lined with plastic on the inside get destroyed in the washer and dryer! You won’t find that problem with the Allergy Store’s products. We received a 100 percent natural cotton, chemical-free, fitted crib pad. The quilted pattern provides extra softness, and I love the fact that this pad is waterproof, yet breathable. This will come in handy when we begin potty training in several months. I hope you’ll take some time to explore the products at the Allergy Store. They also have a line of organic cotton crib sheets and blankets.